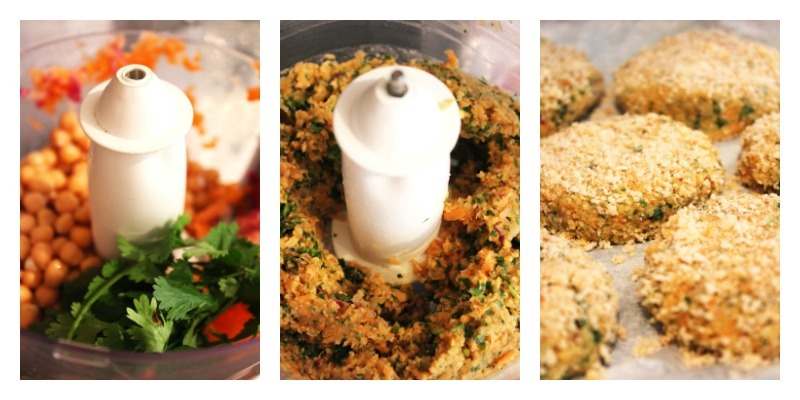 I first shared these Carrot, Coriander and Chickpea Burgers back in October 2013. Jon and I had moved in to our flat just a few weeks earlier and were enjoying having our own kitchen and being able to cook and eat whatever we wanted! I’ll be honest, three years later and the novelty still hasn’t worn off! Jon, being a vegetarian, was particularly excited that I was now cooking for him. Bless him, he’s not the best cook and his parents were very much “meat and two veg” people, so he was very appreciative of my vegetarian experiments in the kitchen. Now Jon isn’t just a vegetarian, he’s got a couple of allergies that make life a bit more difficult. One of which is his allergy to sweetcorn! It’s particularly difficult considering that most vegetarian burger recipes involve the vegetable. He’d asked me to come up with a big, juicy, vegetarian burger that didn’t involved sweetcorn and so the Carrot, Coriander and Chickpea Burger was born. To be honest they started as a bit of a fridge raid. We had carrot, fresh coriander and onion left over from another meal and we always seem to have a tin (or two) of chickpeas lurking in the back of the cupboard. 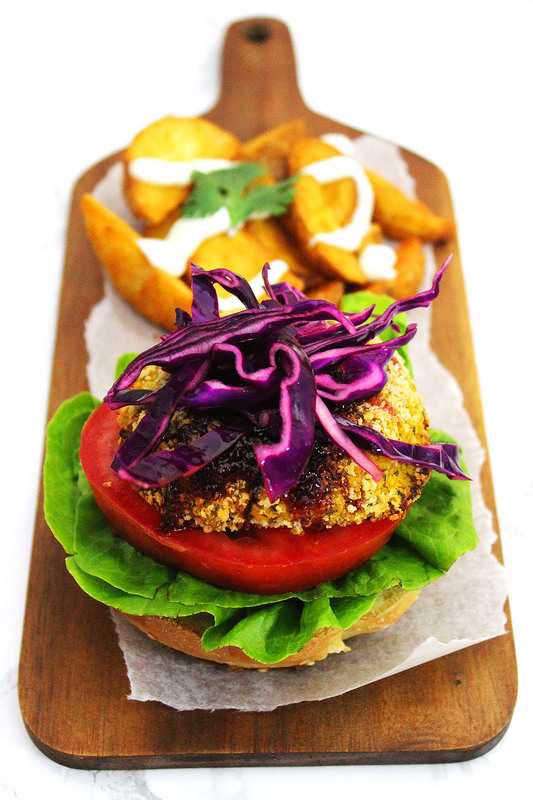 A bit of seasoning, some breadcrumbs and a whizz around the food processor and you’ve got yourself a burger! Carrot, Coriander and Chickpea Burgers are sweet and spicy all at the same time. We choose to serve ours with a good helping of lettuce, slices of beef tomato and a little garlic mayonnaise but feel free to add your own favourite condiments. I also love to top it off with a big helping of cabbage or coleslaw! These carrot, coriander and chickpea burgers are a fantastic alternative to the store bought vegetarian burgers. Prepare your working area by rubbing a little oil on a baking sheet and place to one side. Next using either your hands or a food processor, turn the 4 slices of bread into bread crumbs / alternatively use store bought breadcrumbs. Place half of the breadcrumbs on a plate and put the other half in a large mixing bowl. Next grate the carrot and onion and place in a food blender along with the drained chickpeas and the egg. Pulse until a thick, chunky paste begins to form. Transfer the paste into the bowl of breadcrumbs. Chop the coriander finely and add to the bowl along with the cumin and lemon juice. Give the mixture a good stir until it is fully combined. Divider the mixture into four (or more if you want smaller burgers) and roll into balls. Using the plate of breadcrumbs, dust the patties so that they are coated in breadcrumbs. Place straight on to the baking sheet and repeat for each burger. Chill the burgers for ten minutes whilst pre-heating the oven to gas mark 5. Once the burgers have firmed up in the fridge, cook in the centre of your oven at gas mark 5 (or 180C) for ten minutes on each side: or until the breadcrumbs have crisped up and the burgers and piping hot all the way through. Serve on the wholemeal buns with salad and your favourite condiments. You’ll notice that in the recipe I suggest using a food processor to get the mixture into a paste. If you find yourself without a food processor to hand you can also mash the chickpeas using a potato masher and a bit of brute force. Grate your onion and carrot as finely as possible and combine with the spices as before. You might find you need more liquid (an egg can work well here) or perhaps some breadcrumbs to help hold it all together. 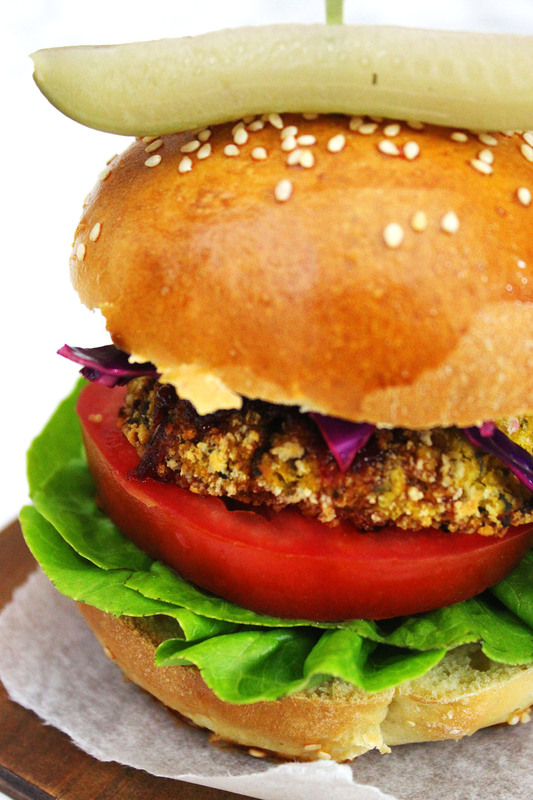 Play around and you too can have great tasting veggie burgers. A burger isn’t a burger unless its wedged between two halves of a burger bun. Of course you can always buy your baps but check out this recipe for Sesame Seed Topped Brioche Burger Buns! They’ll take your burger night to the next level! Get the recipe here. If you like this recipe, make sure you save it to your Pinterest for later! Just pin the picture below. What a great twist on the usual cow meat! 🙂 I love chickpeas, so I would totally make this for myself. Sadly, my family doesn’t like chickpeas. Thanks for sharing. 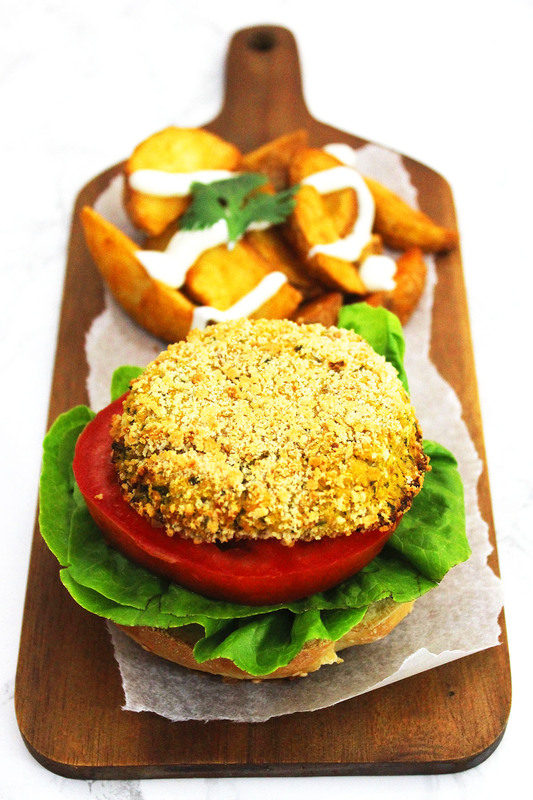 Yum your burgers look and sound delicious, I love the idea of making chickpea burgers and they are just the kind of ingredients I usually have in the fridge too. Perfect with your brioche buns! Thanks Lucy 😀 I’m glad you like them. They really are incredibly simple. For an experiment from a fridge raid, these burgers looks ace. Lucky Jon I say (although not so much re the sweetcorn)! Thanks Choclette 🙂 yeah it’s areally rubbish allergy to have!! No popcorn at the cinema either!